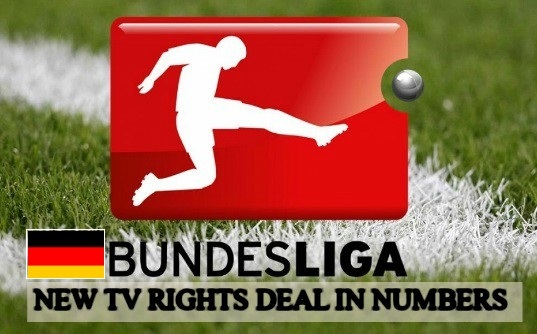 Germany Bundesliga has announced a massive TV rights deal for the 4 year period from 2017-18 season to 2020-21 season where Bundesliga will earn as much as €4.64 billion (£3.6bn) in domestic TV rights deal. The news was confirmed by german FA on Thursday and that will make Bundesliga second most lucrative football league only behind English Premier League. The new deal see 85% increase in the total package from the last 4 year (2013/14 to 2016/17) where total package was around €2.51 billion both domestic and overseas rights combined. While looking at the new deal overseas package the total pacakge from both Domestic and overseas deal might reach around €5.5 billion and that will ensure german clubs will get massive increase in yearly TV revenue. According to early estimates around €1.5 billion will distributed among teams in the German top 2 divisions every year. % increase from last 4 year deal The new deal sees 85% increase in the domestic tv rights money taking it to massive €4.64 billion compared to just €2.51 billion from last deal. Yearly distribution €5.5 billion will be divided into 4 parts and that takes yearly TV money pool distributed to 18 clubs around €1.4 billion a year. Distribution model 65% of yearly pool is divided equally while other 35% is divided according to league positions in the last 5 years. Current TV rights money distribution System: In German football TV rights money distribution is done with pretty simple formula unlike the other three top european leagues (England, Spain, and Italy). Current distribution system comprises of two column payments to the 18 bundesliga clubs. while leagues like England, Spain and Italy uses three pillars of payments to distribute tv funds. 65% is distributed equally among 18 teams at the end of every season. 35% is distributed according to historic league positions in the past 5 years. So how much money German Bundesliga clubs will be earning with the new TV rights deal from 2017-18 season ? traditional top 6 teams will be making between €100 to €120 while bottom club is expected to clear minimum of €60 million with the new deal.